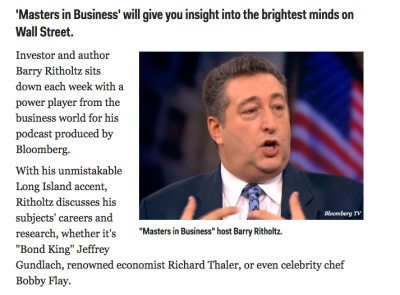 Masters in Business is a popular radio show and podcast on Bloomberg Radio. One of Apple iTunes 20 most popular business podcasts, MiB was originally conceived by its creator, Barry Ritholtz, as a deep dive into the minds of the most influential, savvy and successful people in the world of business & finance. The shows motto – “No stock picks, no predictions” – is what helps separate it from most of the useless financial media fare. Instead of a parade of failed forecasters and other superficial nonsense (stock picking contest, anyone?) 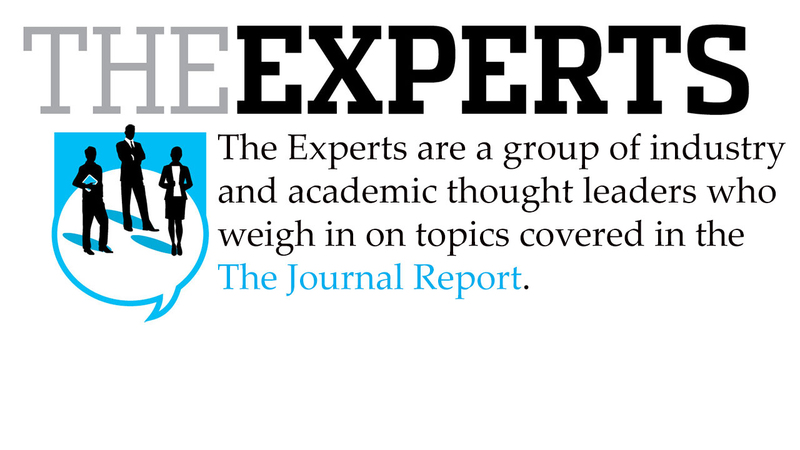 the approach is a smarter and more useful discussion between two market professionals. The show broadcasts repeatedly each weekend on Bloomberg Radio, XM Sirius, and numerous syndication partners. Each show is uploaded, complete and uncut without commercial interruption, onto Bloomberg.com, Apple iTunes, Overcast, and SoundCloud. You can see a fuller discussion on each guest at BloombergView.com. The show was stealthily launched in the Summer of 2014 without any promotion or PR, and very quickly became a “must-listen” amongst Wall Street cognoscenti. 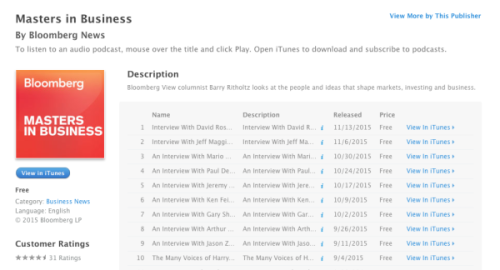 Masters in Business is one of the top 2o Business podcasts on Apple iTunes. Masters in Business has been called “One of the 17 podcasts that make you smarter” — wedged between Planet Money and Mark Maron’s WTF — and has been named one of the Best Finance Podcasts for 2015. Fortune: The Ultimate Guide to the Best Business Podcasts. I cannot overstate how much I have enjoyed listening to your Masters in Business radio series. I have learnt so much about the workings of the financial industry, whilst gaining an appreciation of many people I can’t wait for future interviews. Kind regards, -JW Melbourne, Australia. I’m writing to compliment you on your latest media endeavor, Masters in Business. After listening to your fabulous interview with Jim Chanos, I felt it was important to encourage you and let you know how useful the style you’re employing for Masters in Business is to a non-financial professional like me. I am a 58 year old, self-taught, student of finance, economics and markets. I’m writing to compliment you on your latest media endeavor, Masters in Business. After listening to your fabulous interview with Jim Chanos, I felt it was important to encourage you and let you know how useful the style you’re employing for Masters in Business is to a non-financial professional like me. I’ve downloaded and listened to every one of the Masters In Business episodes and have gotten a wide variety of extremely useful, interesting and unusual information from each one. Although I suppose some listeners might consider them entertainment, for me their real value is in providing a rare opportunity to mentally interact with proven financial titans … on my Main Street level. Your interviews fill a tremendous need for practical “street-smarts” financial literacy. This is especially true for amateurs like me who don’t live in New York City, work on Wall Street or have ready access to the inner workings of the financial industry. What you do so well in your interviews Barry, which no one else I’m aware of is doing, is get beyond the “What are you buying now?” tripe while at the same time protecting us from obtuse discussions concerning leveraged theta dispersions as they apply to credit swap options in the reverse repo market. You have a superb sense of knowing when a guest accidentally veers off into the deep end. I notice and appreciate your deliberately stopping, clarifying details and putting concepts into commonly recognizable terms I can more easily understand. I soak up the living history lessons you coax forth excitedly from your interviewees. I believe you and your guests are enjoying the discussion every bit as much as I am. This is a rare, rare treat in today’s frenzied media world. Yet, there’s more! The way you delve into a “Financial Legend”’s personal work history and as much of their daily routine as they’re willing to reveal, talking with them on a human level as though over a cup of coffee – this is pure magic – and what completely distinguishes your interviews in a crowded field Barry. (I’ve wondered if the relaxed interview style of “Comedians In Cars Getting Coffee” was somewhat of an inspiration for you.) Listening to Masters of Business is comparable to sitting down with a classic investing book such as “A Random Walk Down Wall Street” versus scanning a click-inducing headline article on Marketwatch or Business Insider. I’ve listened to several episodes multiple times in order to more deeply assimilate concepts your guests discuss. I feel like I’m collecting a library of audio investing classics that I’ll happily revisit throughout the years. Finally, and I can’t wait to test this theory out, if you’re as good at interviewing as I think you are, soon on a long drive in the country when my musician wife is least expecting it, I’ll put on an interview and, in spite of herself, she’ll remark “Wow – that’s really, really interesting!” Thank you for a job extremely well done Barry. Please carry on. We’ll definitely be listening.